Where were you when Steve Jobs died, and how did you hear the news? I was snacking on pot stickers with my family at my sister-in-law’s apartment last night when I noticed my Facebook status feed exploding with reports about the death of Steve Jobs — news reported by citizen journalists like you and me. For me, the flood of information began with a simple “RIP Steve Jobs” from my iCrossing colleague Kristen Deye (which I read on my Apple iPhone), followed quickly by an overwhelming number of hastily written tributes and some occasional “iSads” status updates from many other Facebook friends. Within seconds, my friend John Hensler and I were texting each other personal reactions on our iPhones. Ironically, hours earlier, John and I had collaborated on a blog post about why we were not upgrading to the iPhone 4S — and ours was just one post amid a flurry of commentary that is inevitable when Apple, the world’s most powerful news maker, has something to share. As an afterthought, I checked CNN’s coverage of his death, but I was more interested in the raw, real-time outpouring of emotion from everyday people — friends like Andrea Harrison, who wrote on her Facebook wall, “We lost a visionary tonight”; Roger Wong, who blogged about how Steve Jobs changed his life, Lisa M. Blacker, who (like many others) posted a YouTube video of a Stanford commencement address delivered by Steve Jobs in 2005; or Sam Decker, who shared on Facebook a photo of the desk Sam used on his first job out of college — a desk littered with Apple equipment. Later that evening, iCrossing CEO Don Scales sent a heart-felt email to all employees discussing his reaction to Steve Jobs’s passing away, and he also tweeted, “What an amazing person. Steve Jobs. No one is worthy. No one.” I read Don’s communiqué (as well as a blog post by Seth Godin) on my work-supplied Apple MacBook Pro while my daughter sat next to me writing a short story on her MacBook and listened to music on her iPod Shuffle. We can’t all be visionaries like Steve Jobs was. But we can create great experiences for other people as he did. The company that Steve Jobs turned into one of the greatest brands in history is embedded in my home and work life (as it probably is for you or someone you know) because Apple puts people first. I want to remember Steve Jobs by putting people first. Meantime, it will be interesting to see how the brand that was embodied by Steve Jobs evolves without him. So where were you when Steve Jobs died? 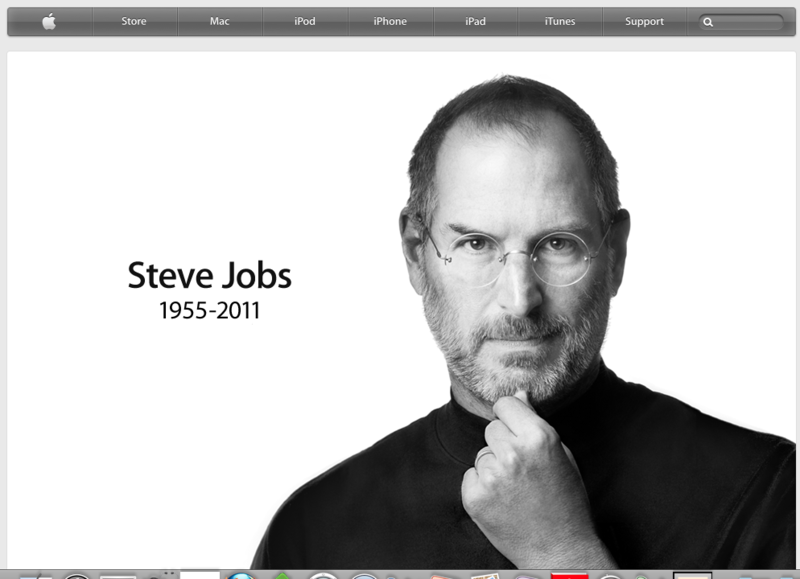 Note: you can share your own thoughts about Steve Jobs by emailing rememberingsteve@apple.com. This entry was posted in Design, Marketing and tagged Apple, iPhone, iPod, MacBook, MacBook Pro, Steve Jobs. Bookmark the permalink.